This one-liner is one of the most misquoted verses in the Bible. 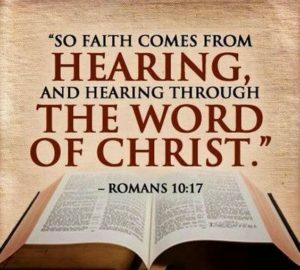 The misquote declares that faith comes by hearing the word, by which is meant the Bible. In other words, more Bible, more faith; less Bible, less faith. The absurdity of that claim becomes clear in the light of the Bible being an account of seven covenants. 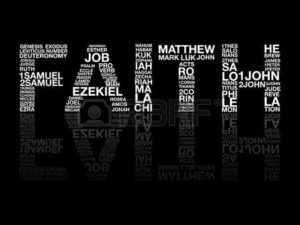 Increasing expertise in the now-obsolete Old Covenant, which the Bible itself claims is not of faith, will by no means increase faith. What the verse does say: more Jesus more faith. In other words, more Gospel, more faith. Now that makes sense. Salvation is by grace alone, through faith alone, and what Paul is teaching us is that the more grace flooding our hearts and minds, the greater our response of faith will be. Two illustrations help us here. Both revolve around Jesus. The first is of the woman with the discharge of blood (Matthew 9:20-26 et al). She was ceremonially unclean and should not have been barging through a crowd to get to Jesus, let alone reaching for Him in order actually to touch Him. Yet, as she watched Him from a distance, she became so filled with faith, that in a moment of unselfconscious abandon she did the unthinkable. She knew that if she could just get to Jesus, her problems would be over. When Jesus sensed her touch and turned to her, He did not see a ceremonially unclean woman who had behaved inappropriately. All He could see was her faith. Here the relationship between grace and faith is well illustrated. When we fix our eyes on Jesus (Grace), doing so fills us with faith. And as we unselfconsciously reach out to Him, all that Grace sees is faith! The second is a point made earlier as we contemplated the Gospel as powerful news. Jesus described the Gospel as a seed. Peter goes one further and tells us that it is in fact imperishable seed. As you know, seeds contain everything necessary for maturity; the whole oak is in the acorn. What we are learning here is that faith is included in the Gospel’s DNA. As the good news of God’s unmerited favour reveals His grace and mercy, it beckons us towards Him, all the while imparting to us the faith necessary to do so. One important point does require clarifying, though, to ensure that we don’t cause confusion. The Gospel imparts faith. It does so to the unbeliever, in order that he or she might believe. It does so to the believer also, not for the new birth per se, but so that the benefits of salvation can be appropriated in that believer’s life. Fortunately, Christ’s once-for-all sacrifice is appropriated by an irrevocable, once-for-ever, action of faith. When we move from in Adam to in Christ, that moment is all-defining. 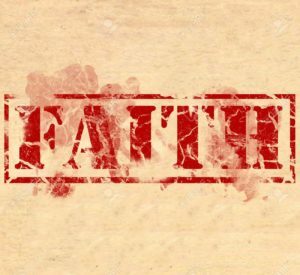 It is not on-again-off-again based on the strength of our faith at any given time (we don’t move into Adam when our faith is weak, and back into Christ when our faith is strong again). The faith that saves in a moment has irrevocable rewards. Not so the faith that appropriates the benefits of salvation. This is a variable. Its lack was what most exasperated Jesus about the Twelve. Their salvation was not under threat, but again and again, just like ours, their faith was found wanting. And just like us, it was for the same reason – faith in God became faith in faith or faith in self. The disciples panicked as they saw the wind and the waves. Peter took his eyes off Jesus and sank. They thought Jesus was fussed because they didn’t have much food with them, forgetting that He’d twice fed multitudes with little. They found a demon impossible to dislodge because they did not believe. As with us, as Jesus pointed out, anxiety on any level is rooted in unbelief. The remedy is simple. Faith is always a gift from God. That is true of the faith that saves, and it is true of the faith that appropriates the benefits of our salvation. He is always the source of faith, and it is always all of grace that we ever have any faith at all. Faith does not stem from our efforts. It is unselfconscious. Its eyes are on Jesus, not on itself. That’s why it so pleases Him. Faith has the main thing as the main thing, always. Perhaps the best way of summarising this is to say that Jesus is faith’s object. Authentic, mountain-moving, water-walking, giant-slaying, sick-healing, dead-raising faith is focused on Him. It’s not looking at the mountain, raging sea, giant, tumour, or corpse. If you ever find yourself wondering whether you’ve got enough faith for something, the answer is no. Asking the question means that your faith is displaced, and you’re relying on yourself rather than on Jesus. Dynamic, vibrant faith is within reach of all of us. All it requires is for us to break away from crippling self-preoccupation and yield to grace. Just like everything else that comes our way thanks to Jesus, . Faith is by grace. When we lack faith, we need grace. We need Jesus. We need Gospel! Paul clinched the argument when he taught that reigning in life is through the abundance of grace and the gift of righteousness (Romans 5:17). Christians walk by faith. They stand in faith. They please God by faith, and they run their race by faith. They even fight the fight of faith. They are believers, and believers believe! But while it is true that every victory is by faith, it is even more true that every victory is by grace. God even does us good when our faith wavers. How much more so when our faith is strong. Are you in need of more faith? Immerse yourself in the Gospel. That will do it!